Save To Win is a prize-linked savings product, which offers prize drawing entries monthly, quarterly and annually, in return for each $25 savings deposit made into the Save to Win certificate account. In the end, you at the very least walk away with your savings, plus interest. You could even end up winning $1,000! Join, or if already a member, visit any TwinStar Branch. 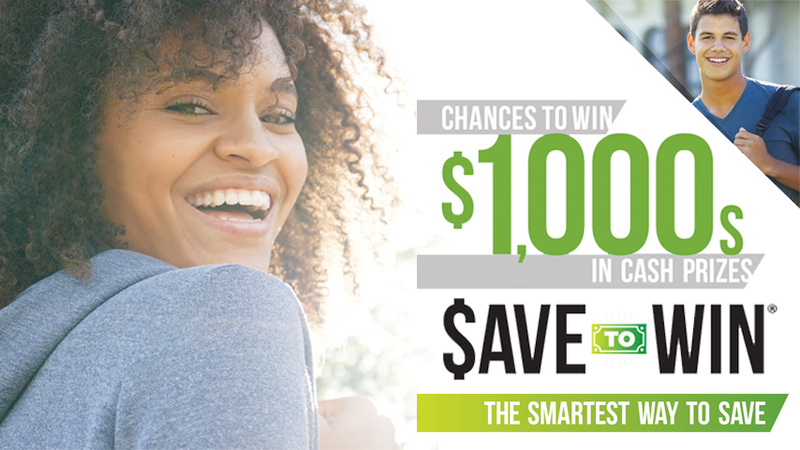 Open a 12-month Save To Win share certificate with at least $25. This is considered your first entry into that month’s drawings as well as the grand prize drawings. Keep making deposits into the Save To Win share certificate during the 12 month certificate term. Every $25 is another entry to win, but you can only earn up to 10 entries a month. A participating member is limited to one (1) Qualifying Save To Win Share Certificate at one (1) participating credit union, with a minimum opening deposit of $25. To be an eligible participant you must be a legal resident of the state of Washington, be 18 years or older, and have a prime share account in good standing. More than one (1) withdrawal will result in the disqualification of the certificate from consideration for prizes and forfeiture of any and all entries for monthly and annual prizes and will result in the closure of the certificate. If a Member with a Qualifying Save To Win Certificate moves out of the State of Washington, they become ineligible for the Raffle. The member will continue to be the account holder but deposits to the account will not constitute qualifying Raffle entries. To be eligible for the Annual Prize Drawing, a participating member must have had their Qualifying Save To Win Certificate open for all 12 months of the Raffle period. For complete rules stop by any TwinStar branch or go to the Save to Win Rules page.